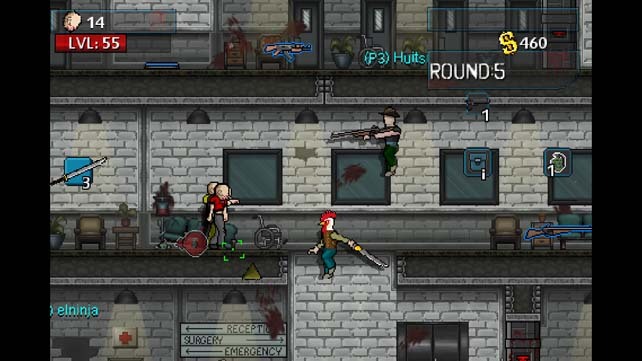 Zombie Kill of the Week-Reborn is an Indie action side scrolling shoot em up game developed by Still Running and published by Merge Games and Tagstar Games. The game has been in development for 4 years and came to Steam on 13th of March 2015 so the Steam audience hasn’t had it for too long. 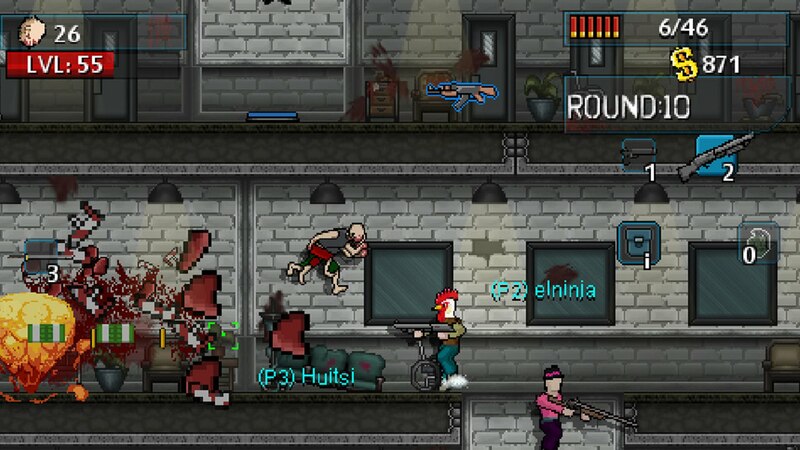 It has recently had a Multiplayer update which allows you to fight the zombie horde with up to 4 people in a single game. I played the game in both the single player and the multiplayer with one of my friends and both were serious fun. The basic principle of the game is that you need to survive for as long as possible in a round based system. The higher the round the more powerful and higher amount of zombies there are, kind of like Horde mode in Gears of War or Zombies in the Call of Duty series. As you kill more zombies you will get money with which you can open doors, activate jump pads and buy weapons which all make killing zombies quicker and easier. As you get more kills and go higher in the levels you will gain what I like to call tokens. Now these tokens can be used in the player menu to access a wide variety of perks, skills, weapon customisations, new weapons, and items for which to kill zombies and let’s not forget the character customisation. So here I am playing this game by myself for a bit to get a feel of it and I’ve accumulated about 50 of these tokens. I think to myself “Hmmm what could I do with these?” next thing you know I am dual wielding pistols dressed in a suit with a top hat and monocle throwing Molotov cocktails and exploding meat into the zombie horde all whilst trying to hold myself together with the hilarity of my situation. There are numerous different heads, bodies and legs which you can use to create your abominations of fashion and you can spend tokens to up some skills on each of the weapons including, damage, accuracy and reload speed. You can also spend these to customise your character skills including, weapons handling, melee skills and crafting to name but a few. 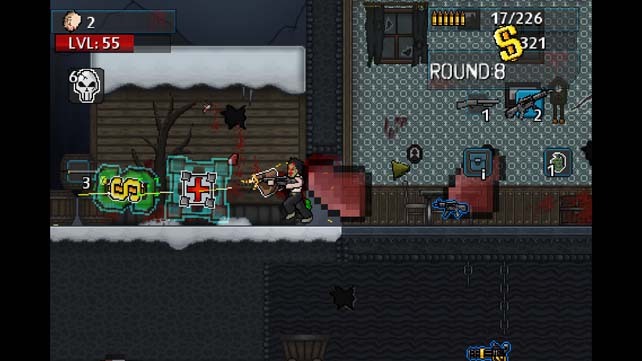 There are numerous items that can be purchased from Molotov cocktails to plasma shooting robots and everything in between, including explosive meat. The best feature I found is the crafting feature where you can buy all of these items outright with the tokens or you can find crafting items during gameplay and when you come back to the player menu, use those items to craft something. it can be a turret or an explosive barrier, every one of the purchasable items can be crafted using the different things that you will find in the world and in your epic quest to live and kill. All of the aspects of the game work great!The combat feels good especially when you are head shot numerous zombies in a line with a pump action shotgun and the combat doesn’t feel outdated which with a lot of other zombie horde games it does. One of the most important things in these types of games in my opinion is pacing. If the rounds are too slow paced then people are going to lose interest very quickly. However if they are too fast paced then the game won’t feel difficult and it won’t keep people hooked. ZKOTW has some of the best pacing around! The initial rounds are difficult but can be conquered with the melee weapons before you need to bust out the pistol or pick up that rifle. In the later rounds yes it is anarchy but due to the power-ups and upgrades you have given your character it will seem slightly easier. The graphics of the game are pretty spot on but I’m a big fan of pixelated games especially when they are done well. It’s easy to see a difference in the weapons and also the zombies themselves so you know when you’re actually hitting something and not just aimlessly shooting over its head. The music to this game is absolutely awesome, a heavy metal soundtrack to the killing really makes for some great gameplay and a really gritty experience which is only amplified when you are playing with someone else. The only real downside to playing with someone else is going through a sign up procedure which can all be done in the game options menu so you don’t have to back all the way out. Just open a browser, validate an email address, pick a username, something profound of course, and enter a password and that’s it you’re online. Enter a lobby, which you can create yourself or use of the existing ones from the game, and you kill the zombies with friends or strangers. Due to the character customisation it’s easy to differentiate yourself from the other players in the game. There is also no friendly fire but explosions do still have a tendency to blow your legs off. So at the moment the game is currently priced at £4.99 on Steam or you can by a 4 pack for some friends for £14.99 so it’s pretty good saving there and I have to say it’s a great addition to your library because there’s virtually no load times and its great to just pick up and play. Stick around for some gameplay videos on this because I’m really looking forward to showing it off. This entry was posted in Uncategorized and tagged Indie, Merge Games, Steam, Still Running, Tagstar Games, Zombie Kill of The Week. Bookmark the permalink.